Our last day in Iceland began with a morning flight from Akureyri to Reykjavik on Air Iceland, the domestic carrier. Oliver took this photo out the window of our small plane, proving that Iceland is just as strange from above as below. View from the plane flying into Reykjavík. Note dark blur of propeller blade on right of frame. Yikes! We had over 6 hours until our flight out of Keflavík to Seattle. First, Jakob, my Icelandic publisher, picked us up from the Reykjavík airport and we drove around the city a bit for a last look. “There’s our new mayor,” Jakob announced casually as we wound through some old streets of Reykjavík. We turned our heads and sure enough, there he was, Jón Gnarr, stand up comedian, leader of Besti Flokurinn (The Best Party), and newly elected on our 2nd night in Iceland, striding alone through Reykjavík in dark sun glasses and a cell phone to his ear. Best of luck to Besti Flokurinn! ... but turn your gaze across the street in the other direction, and you’ll see sights like this one: a half constructed apartment building stands unfinished and unoccupied a year and a half after Iceland’s economic crisis. Jakob then handed us off to Almar Grímsson, who took us to have lunch with his wife at their home in Hafnarfjördur. Almar is someone I should have met at the beginning of the trip, at my first event in Reykjavík. After all, he is the president of the Icelandic organization Þjóðræknisfélag, counterpart to The Icelandic National League of North America; the person who arranged for my donated plane ticket from Icelandair; and the co-sponsor of several of the book events on this tour. But Almar was blindsided in a terrible car crash a day before we arrived and was lucky to escape with his life. He wasn’t well enough to venture out to introduce me at the event on May 31, but he’d recovered sufficiently by June 11 to provide us with a wonderful send off. Our last meal in Iceland, prepared by Almar’s wife Anna: a traditional spread with various types of herring dishes, local Icelandic cheeses, and gravlax with homemade dill sauce. Almar and Oliver bonding over golf talk. Turns out Almar is a regular at the lava-encircled golf course Oliver played our first weekend in Reykjavík. Almar keeps separate clubs to use when hitting golf balls out of lava patches. Somehow at lunch with Almar and Anna we got on the subject of Vigdís Finnbogadóttir, one of the world's first democratically elected female heads of state (1980-96), a woman whom both my late mother and I have admired greatly. I remember the incredible excitement in our household on Long Island when news came that a woman had been elected president of Iceland! It turns out Almar not only knows Vigdís personally, but will be seeing her on Monday. I asked if he would give her a copy of my book, and so my last moments in Iceland were spent hurriedly signing a book to Vigdís outside the airport. "It is a great honor for me to present this book to you through Almar," I began my inscription. For some reason, this act nearly made me cry. Maybe it was because of how much Vigdís looks like my mother and many of the relatives in my family. She has our cheeks. Maybe it was just a culmination of the entire book tour, the privilege I felt of being able to return to Iceland after nine long years away and to engage with Icelanders about the novel it took me so many years to write. Maybe it was handing the book to Almar amidst our pile of suitcases outside the airport and realizing that I was actually leaving Iceland. It's going to take a long time for this trip to sink into my psyche. So many startling landscapes and long lively discussions with Icelanders we met along the way, it seemed we were there for 2 months rather than 2 weeks. And an Icelandic summer day is really two days in one, since the sun never sets, and everyone seems to keep going around the clock with frenetic energy, savoring every moment of their brief summer before the long winter sets in. We've seen a woman planting flowers at 11 pm and a young man painting yellow lines on a roadway at 10:00 at night. The midnight sun allowed us to take in so much more... yet I'm not sure I've really taken it all in yet. The book tour may be over, but I hope you'll keep reading the blog, because I've collected quite a bit more material for posts about the trip, including thoughts on the Kreppa, instructions for making Icelandic rye bread, things to think about if you're planning a trip to Iceland, and more. Plus, I still need to publicly thank everyone who made the trip possible. And that's another post in itself. But now it's Monday morning in Oakland, California. It's 5:30 a.m. and the sun is actually rising after definitively setting many hours ago. And Oliver and I are about to get ready for our first day back at our respective jobs. While our souls are still making their way back from Iceland. Thank you for sharing this trip. I've just started your book and these pictures and stories have certainly set the mood! I've completely teared up over the wonderfulness of your presenting your book to Vigdís through Almar. I will see you in a week or so ... I've just been invited to join the slumber party at Pam's farm! Hence I am catching up on your musings and re-reading Freya. 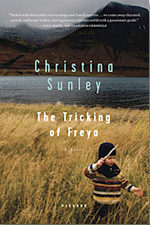 I am almost done reading Thorstina Walter's Modern Sagas and I am wondering if there might be another character or two in Freya that are based on some of the great Icelandic pioneers detailed in her book. I look forward to asking in person! Iceland should be my next trip. Very special country..